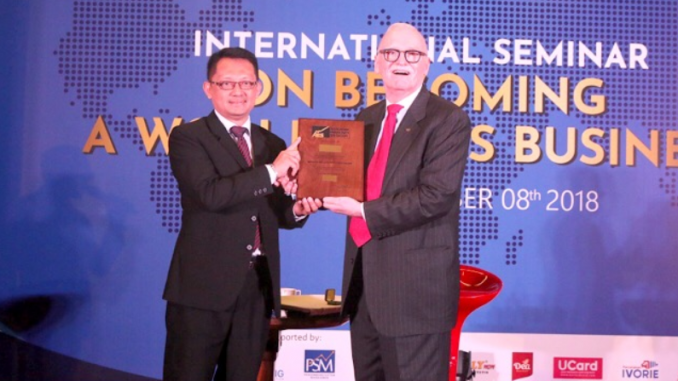 The great news for Indonesia, one of the best sons owned is Armala Founder and President of the Human Plus Institute to get an international title Master of Productivity Specialist (MPS) from the Association of Productivity Specialist (APS). With the achievement of the accepted MPS certificate, it means that he has succeeded in proving that the Indonesian nation can be equal to the nations that have developed in the world. Once again this has become a pride for me for 16 years as a career consultant. In the world of management consultants there are several levels, the first being America and Europ,e, the second caste in East Asia, and Indonesia and other Southeast Asian countries at the last level. With the achievement of the MPS certificate, it means that he has succeeded in proving that the Indonesian nation can be equal to the nations that have developed in the world. Once again this has become a pride for me for 16 years as a career consultant. Bob Jacobson, APS Director, added that the awarding of the MPS is certainly an extraordinary achievement. Because, to achieve this MPS certification, a productivity specialist must have at least 14 years experience and complete at least 10 improvement projects with various complicated qualifications. “Indonesia must be proud to have Armala, which we value meets these standards. Besides being the first Indonesian to win MPS, Armala is also one of nine people around the world who receive MPS certification throughout 2018, “Bob said. APS was established in 1976 and based in New York United States, APS is a global organization that conducts performance evaluations and issues certificates for management consultants worldwide.